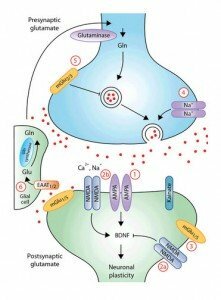 A new drug that stimulates the glycine site of NMDA receptors had rapid antidepressant effects in the just released results of a phase II clinical trial. The drug substantially reduced depression symptoms, with no severe side effects. The NMDA receptor has 2 sites that are involved in its activation. One site is stimulated by glutamate or aspartate. Another site is stimulated by glycine. For full activation of the receptor both locations need to be activated. Glutamate will stimulate the receptor by itself but only moderately but the addition of glycine results in a robust response. At the highest dose tested, 72 percent of study participants had a clinically meaningful response to this compound, known as NRX-1074, within 24 hours, compared with 39 percent who responded to a placebo. This study used intravenous administration of NRX-1074, which would limit the usefulness of the drug. However, NRX-1074 is relatively well absorbed orally and a 2nd phase 2 trial using an oral form has already begun. The new study will also look at the question of whether repeated daily doses provide a sustained effect, this study just looked at the response to a single dose.